The BMP180 digital sensor is designed for a wide range of applications, including measuring air pressure and ambient temperatures, which makes it useful for predicting the weather as a supplement to navigation systems. It has been customized to output data in blocks of plain text. The block output logs on the I2C bus at address 0x77h. Because you have no way to modify the address, you can only operate one such block per device. The sensor range of the BMP180 is 300-200hPa (hectopascals), within a margin of 0.03hPa or around 17cm in height. With a few special exceptions, air pressure is the amount of force exerted by the air above us. Because air is extremely light, you generally are unaware of changes in pressure. However, you may be familiar with the sensation in your ears as you drive up a mountain or go up in an elevator – air pressure decreases simply because there's less air as you go up. The amount of air in a certain area can be measured to help you work out your current altitude. Measurements are taken from MSLP (mean sea level pressure). The average air pressure at mean sea level is 1013.25hPa. As your altitude increases, the air pressure decreases exponentially. Table 1 shows the corresponding pressure for certain landmarks around the world. These should be sufficient to help you understand whether the sensor correctly measures the air pressure. assumes that air pressure falls by 1hPa per 8.5m of altitude, which is a rough approximation of the real value. In meteorology, air pressure is used for forecasts. In areas with rising air pressure, cloud formation is curtailed, and the sun most likely comes out. Conversely, low-pressure areas are likely to produce bad weather. As such, it's possible to predict weather several hours ahead of time. However to make an accurate forecast, you need to take measurements from a number of locations. Up to this point, I've discussed what the sensor can do in theory. 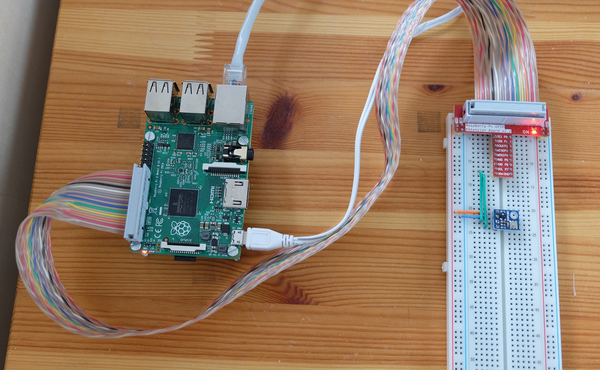 If you're ready to get started with a hands-on project, it's best to find a ready-made module. Although Bosch has discontinued the BMP180, you can still find it on Amazon and eBay . Figure 1 shows the simple structure of the BMP180: You simply connect the sensor as shown in the accompanying instructions. Make sure, though, to use the correct operating voltage of 1.6-3.6V. This marries up nicely with the Raspberry Pi's GPIO pins, which use 3.3V. Figure 1: The layout of the air pressure sensor is extremely clear.